Richard Irwin (Belper, United Kingdom) on 16 March 2008 in Plant & Nature. Haha that's such a fun thought. :) Beautiful capture! The details of the drops are incredible. the DOF is really kool. Even bugs deserve to have fun! Very Nice shot. Excellent Focus & Lovely sense . . . Your archive is full of really beautiful shots. Great DOF here. Amazing play of light on the dewdrops, wow that's impressive!!! Wow - I love this shot. Great DoF, amazing color and detail. Well done!! Superb composition. The contrast between the pearls of water and the green of the leave is really beautiful and makes for interest in both form and color. Really well done. As usual evocative! Lovely to catch up with you stuff Richard! FANtastic, Richard! The central focal point works brilliantly with all the surrounding droplets not to mention that amazing detail and green. Brilliant! Could be fun - if you're a bug. Great, colorful macro and nice job with the DoF. ...or diamonds scattered on leaves! 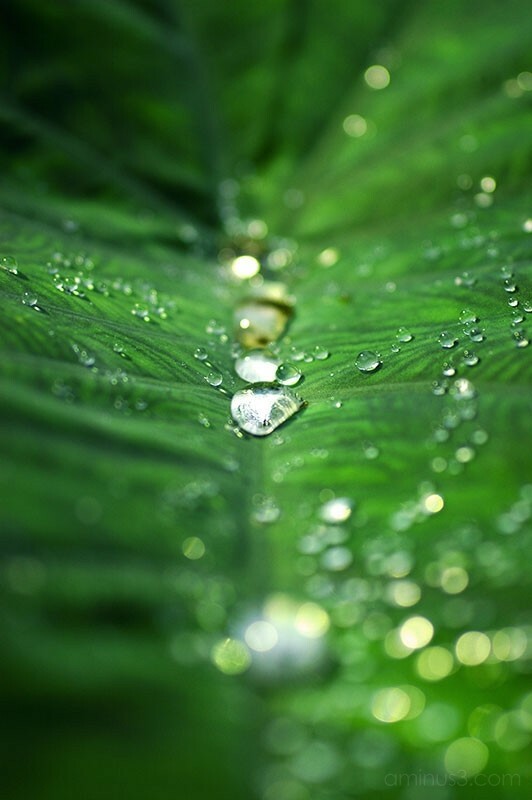 This is beautiful, the midpoint focus on the water droplets is fantastic.